Would you like a raw egg with that? We have very little negative to say about Tokyo. I know, it breaks with tradition, but it’s an excellent city and we’re agreed that we’d like to return. The biggest disappointment was the lack of teleporters and advanced robots, but we did use a space-age loo. Don’t close the blog just yet though – there were plenty of minor disappointments and gripes with which to regale you. You may recall from the previous post that we were to arrive in Tokyo in style, via a fortuitous business class upgrade. I have only one previous business class experience to compare to and I’d be lying if I told you it was on a par, but with free unlimited booze, beautiful food and as much deferential bowing as we could take, we weren’t complaining. The chap adjacent to us definitely wasn’t – he put away more food and drink than I would have thought possible for a man of his (average) size. He even squirreled away several miniature bottles of Bailey’s to take with him. Our first day in Tokyo started with breakfast ordered from a vending machine (pretty much pot-luck considering the photos were the size of thumbnails). I ended up with noodles and greens in a broth with an underdone poached egg and two sweet tofu spring rolls filled with rice, while Jane plumped for the noodles in broth plus small bowl of rice covered with a mixture of a whole raw egg and soy sauce. It was lovely, as was almost all the Japanese food we had, though the raw egg aspect didn’t go down well with me. 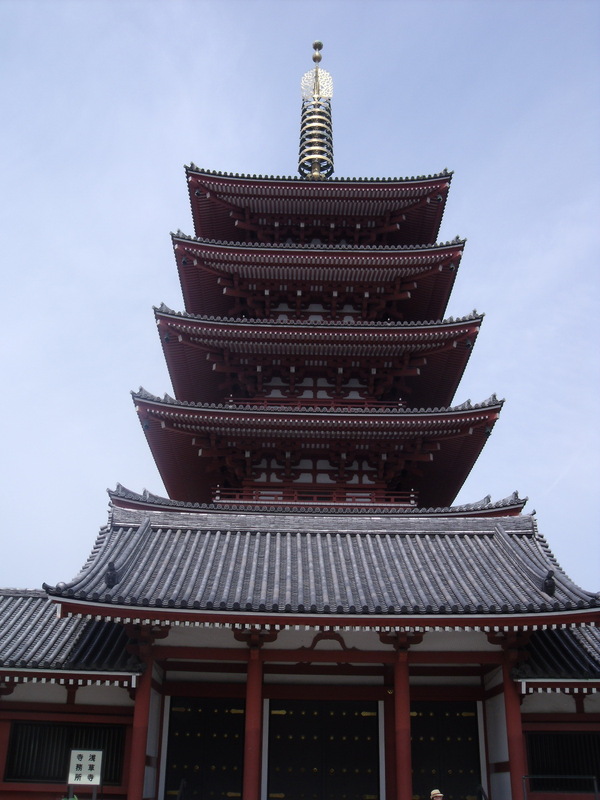 Our first stop was Senso-ji temple in our hostel’s neighbourhood. As has become customary on our trip, it was undergoing partial renovations, but we had a wander round, trying to avoid stepping on any of the 80,000 school kids in attendance. We took a cruise along the river, which was less than inspiring with literally nothing to see apart from the backs of warehouses – the residents of Tokyo obviously haven’t cottoned-on to the value of waterfront property. 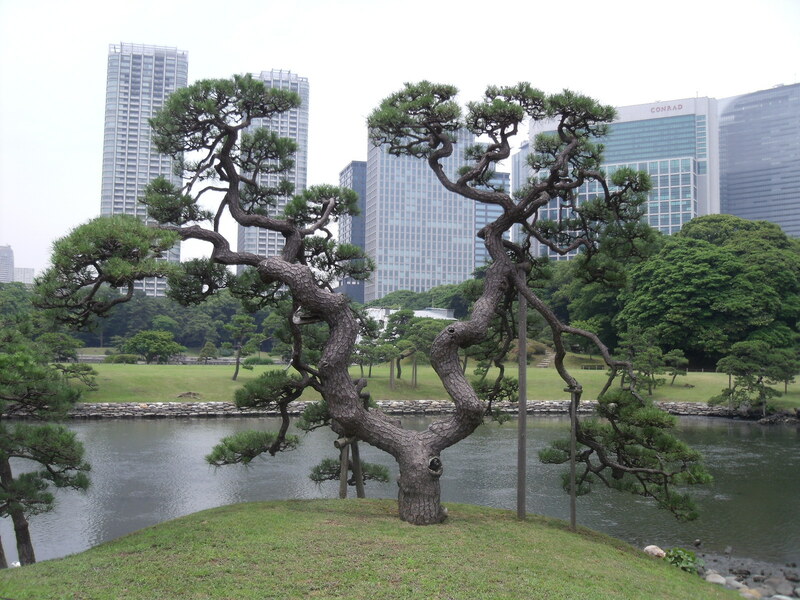 More picturesque were the marvellous gardens of Hama-Rikyu-Teien – all the more marvellous considering their high-rise backdrop. Next we walked through Ginza, sampling some culinary delights offered as samplers in the basement food halls of department stores (melt in the mouth beef on a skewer and cooling fruit jelly being our two favourites). Lunch was another pot-luck affair, this time in a Japanese fast-food place where Jane was the only female diner, but where you wouldn’t recognise the delightfully presented and tasty meals as fast-food. In the afternoon we sauntered through Akihabara electric neighbourhood and sampled some Japanese beers back at our hostel before dinner at a street cafe serving yummy fried squid/fish. One of the perils of Tokyo was the pavements, which you share with kamikaze cyclists, sometimes on their phones and on one eye-rolling occasion, reading a book! There’s really no need for it, since the roads are not too busy, but it certainly keeps you on your toes as a pedestrian. The following day we went for a bit of culture in the morning, visiting the Tokyo National Museum, which I’d assumed would give us some Japanese history, but was in fact more a view of Japanese art history. Nice as that was, it wasn’t quite what we expected. The rest of the day was spent visiting a couple of other neighbourhoods. First up was Shibuya in a vain attempt to photograph some “love hotels” in the rain. 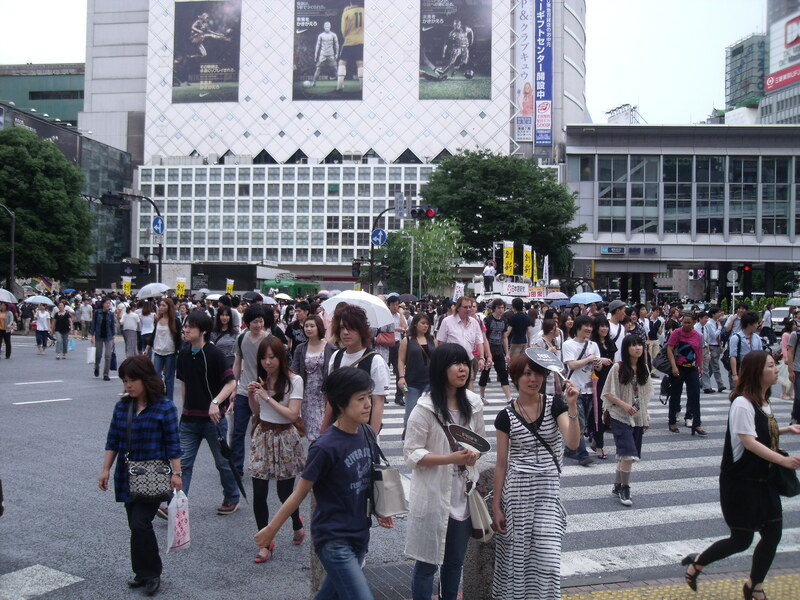 We did get involved in the intense human traffic at the huge and famous pedestrian crossing there. We travelled around the city on the excellent metro, noting that there are two accepted pastimes therein – sleeping (seriously, the Japanese need more sleep, they were almost ALL asleep at any time of the day and we memorably saw one snoring young man dribble on his own shirt) and looking at your phone – the number of people staring at their phones was unbelievable on every journey – they must be killing their eyes (the Japanese also don’t seem to wear sunglasses, even in bright sunshine – clearly asking for trouble). The evening saw us in a stiflingly hot, authentic Japanese cook-your-own savoury pancake restaurant. The main enjoyment was in the surroundings and the cooking, rather than the food itself, which was rather stodgy and plain. Kneeling on tatami mats whilst trying to keep your dignity is obviously an acquired skill. The following morning I declined breakfast, which proved to be a wise decision when Jane ordered something which the chef seemed keen to steer her away from. Jane, knowing best, was adamant that she wanted it, even after he made her sniff the main ingredient and then showed his amazement that she still refused to pick something else. And so it was that I watched her eat some kind of viscous, fermented soy bean mix with rice which draped itself from bowl, via chin, to mouth. It was quite disgusting to watch, but tasted OK (she claims). 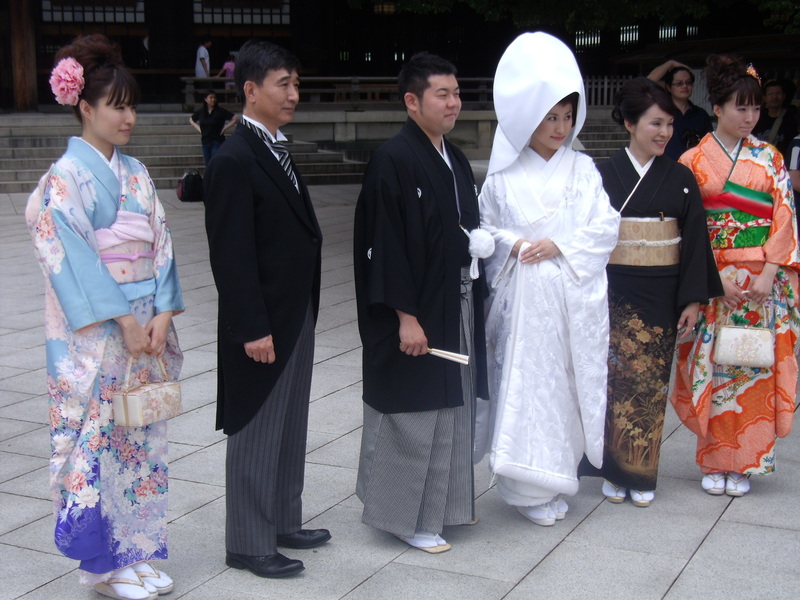 By the time we got to the Meiji-Jingu shrine in Harajuku, Jane had a mostly clean chin, though there were still some rogue strands of the cheesy smelling gunk in her hair which it was too late to tell her about. We were very lucky at the shrine to see several ornate weddings and associated processions (with about 100 of us tourists taking photos which the security guards semi-protected the wedding party from), plus a fair few Westerners pretending to be Japanese by getting involved in the elaborate praying (clap twice, bow, clap twice more, throw some coins into the pot, do the hokey-cokey….). After a stroll through the temple gardens, of which the iris garden was the only noteworthy feature, we headed back to Harajuku proper for what the guidebook had described as the dress-up club, held every Sunday, where throngs of high-school girls get dressed up wackily and pose and preen for tourist photos. We saw three, although the general fashions were pretty wacky if you ask me. 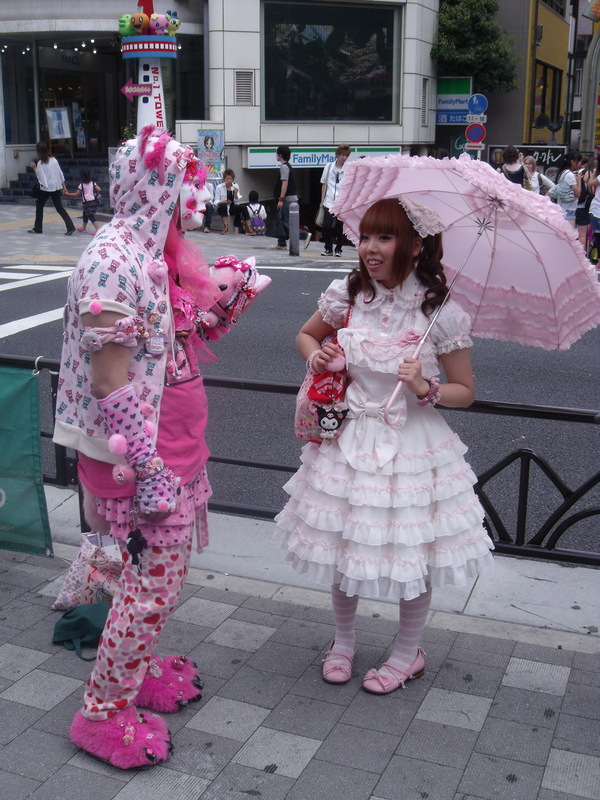 Would your Mum let you out of the house dressed like this? 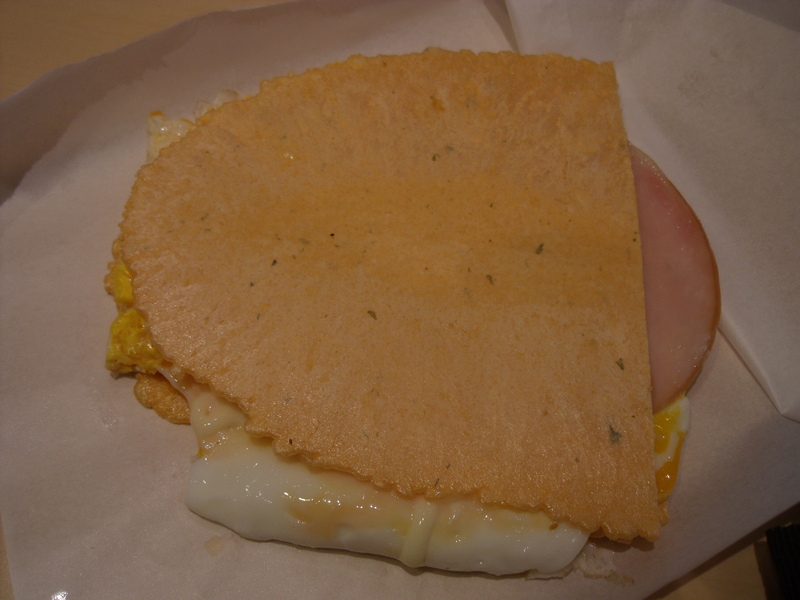 We consoled ourselves with the worst food in Japan for lunch – I had a slice of ham, a slice of cheese, an egg and 2 litres of mayonnaise between two wafers, while Jane had squid in soggy batter with a similar mount of mayo with added brown sauce. A quick word on the internet cafes in Japan, since we had a quick blast after our lunch: they are like a different world – you could live in them. You can choose between several types of private booth and even the basic one we had contained a sofa, PC, DVD player, Playstation, take away menus and reclining leather chairs. Free drinks and showers were provided in the communal areas as were DVDs and games. Australia could learn a thing or two from Japan in the internet cafe stakes. We attempted to have our first proper night out in several months in the lively Roppongi district, but sadly it started badly and ended badly. When we arrived, we went to get cash, which we successfully did 30 minutes later after trying about seven ATMs, none of which liked our foreign card (strangely, most of the ATMs in Tokyo are in convenience stores). We then had a couple of bottles of beer in a tiny bar where thankfully it was happy hour, so the beer was half price and therefore practically a giveaway price of three quid a bottle. This preceded our second wild goose chase of the night – trying to find a dinner venue. After another half-hour search, we ended up in another brightly lit Japanese fast-food place, having only seen noodle bars or very, very pricey restaurants in between! Our hearts weren’t really in Roppongi any more, even after availing ourselves of the Buck Rogers loo in the restaurant, which I believe had a button which would have rinsed and polished your buttocks should you have wished, so we headed back to Asakusa for a beer in a rough and ready Japanese bar where English was not spoken and none of the menus were translated. Our first mistake was saying “We’ll have what he’s having”, which happened to be a beer we’d seen elsewhere called Hoppy Beer. When it arrived in a bottle and accompanied by about a half-pint of clear liquid in ice, Jane made the second mistake of taking a large glug of the “water” to discover it was some kind of strong booze. We believe it was sake and mixed with the beer it wasn’t half bad, quite malty. There was then a football match, but I can’t recall the result. You may recall that in New Zealand when we visited Mount Cook, it failed to show itself. It was with some trepidation then, that we made the 2 hour journey to Mount Fuji the next day, and when we caught glimpses of the snow-capped peak on the way in, it was indeed partially covered in cloud. By the time we’d got to the lake viewing point, the mountain was invisible, and remained pretty much that way until we got back to Tokyo. 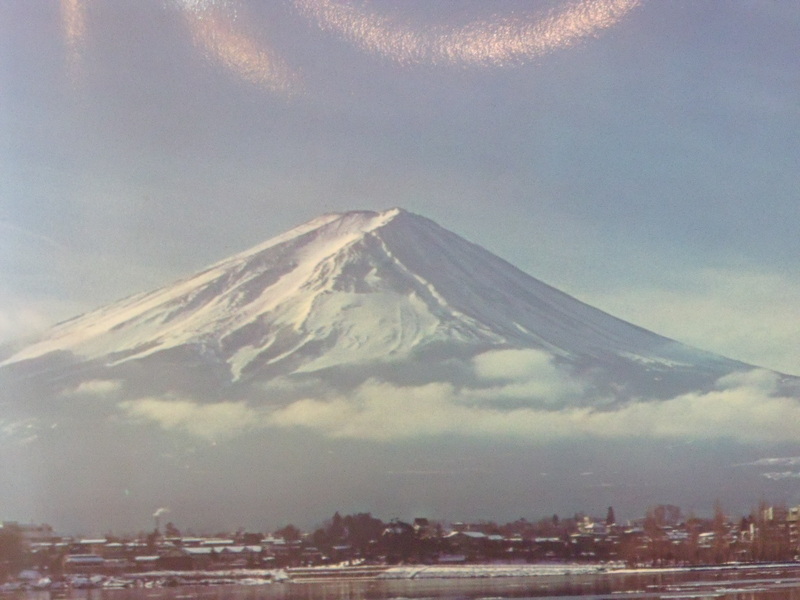 We’d spent all day going to see a mountain that we couldn’t see, but at least we can say we’ve been there, and Jane took a great photo of a picture of Fuji-san in the cafe where we had lunch. Well, there's no point putting a picture of cloud in, is there? I have to report, from extensive staring at people, that the habit of not covering your mouth while yawning has reached every country we’ve been to (when and where did this become anything other than impolite (and I know I sound like my own mother)? ), but the Japanese are the worst. They have also reminded us of some of the bodily functions that are considered acceptable in public Asia, so we’re letting rip. We had a splendid dinner after the Fuji disappointment, of tempura prawn for Jane and beef in ginger for me, washed down with our first sake which hadn’t been mixed with beer (quite nice, a little like sherry). Jane continued her trait of bizarre food choices by picking a dessert which was essentially marshmallow covered in sticky soy sauce which even she failed to finish. Our last day in Tokyo saw the rain falling steadily when we rose at 6 to visit the Tsukiji fish market (the one where they throw fish around, though sadly before the metro system starts running, so we missed it). It was still pandemonium when we arrived, with carts whizzing here, there and everywhere carrying boxes of fish. You really needed eyes in the back of your head. 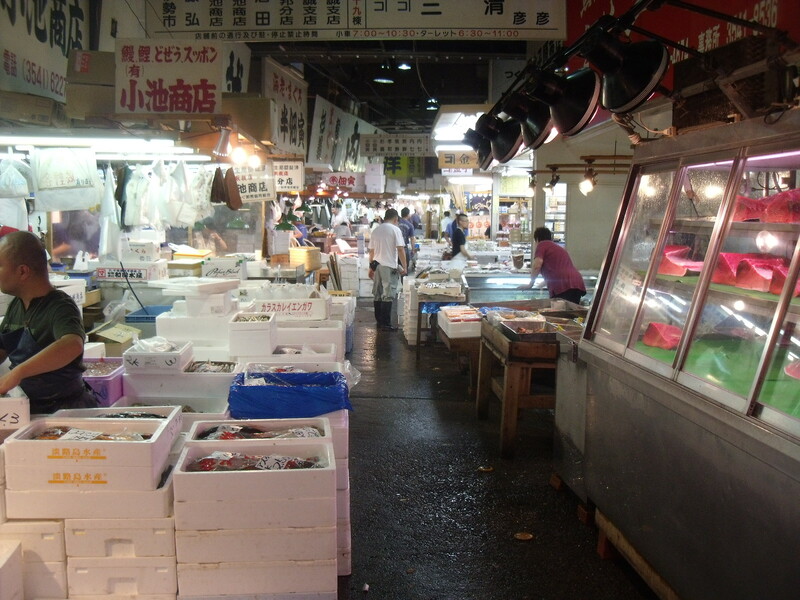 The market itself was huge, with fish we’ve never seen before and enormous tuna being hacked into pieces on band saws. 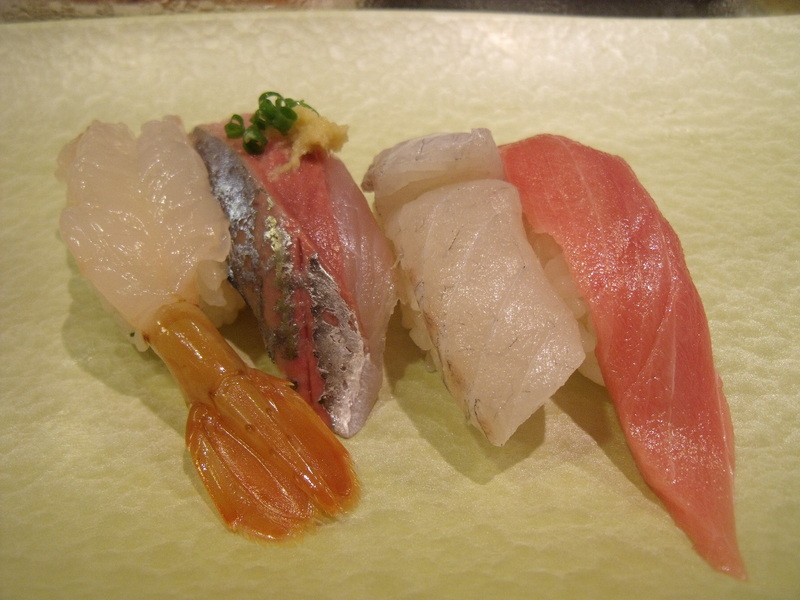 We breakfasted right next door on sushi, which must be the freshest and most authentic sushi on the planet. We finished our time in Tokyo with the Edo-Tokyo museum, which was what the Tokyo National museum hadn’t been, giving a well translated history of Tokyo. Mysteriously, the display which obviously contained info about kamikaze pilots was not translated! It was a very good museum, if a little disjointed. The same couldn’t really be said of the sumo museum next door, which was housed in a single room and was entirely in Japanese. So, a fabulous city, full of tiny, weeny dogs (presumably for the tiny, weeny apartments) and great food. Where grown men read comics, where even the most straight-laced businessman will have several trinkets attached to his mobile (we saw one teenager whose trinket collection was bigger than her phone) and where beer comes in vending machines. We’d recommend it to anyone, and it’s probably not as expensive as Australia. Our stay in Japan ended on a sour note when I had to give a very withering look to a member of Japan Airlines staff at the check-in desk when he failed to upgrade us to business class. He won’t make that mistake again. Grudgingly we turned right on entering the plane into cattle class, bound for what we found to be a bit of a cattle class city in Bangkok. 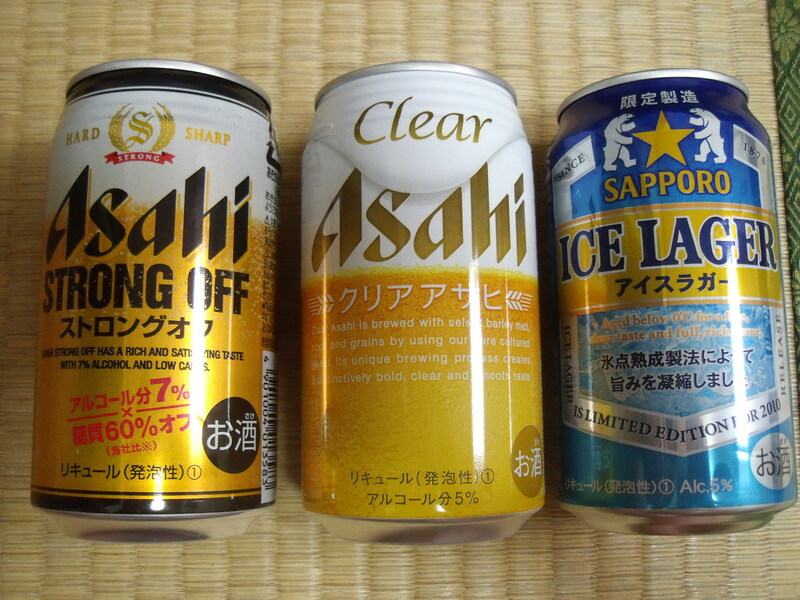 But more of that in the next post……..
Japanese bath - apologies if you're eating! OMG, the food, give me more pictures! 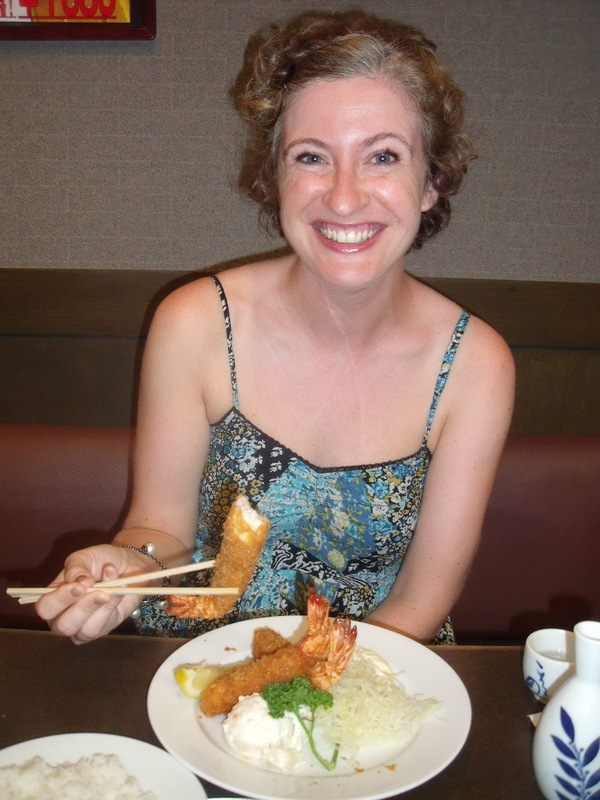 Drooling over the tempura and sushi… baby! 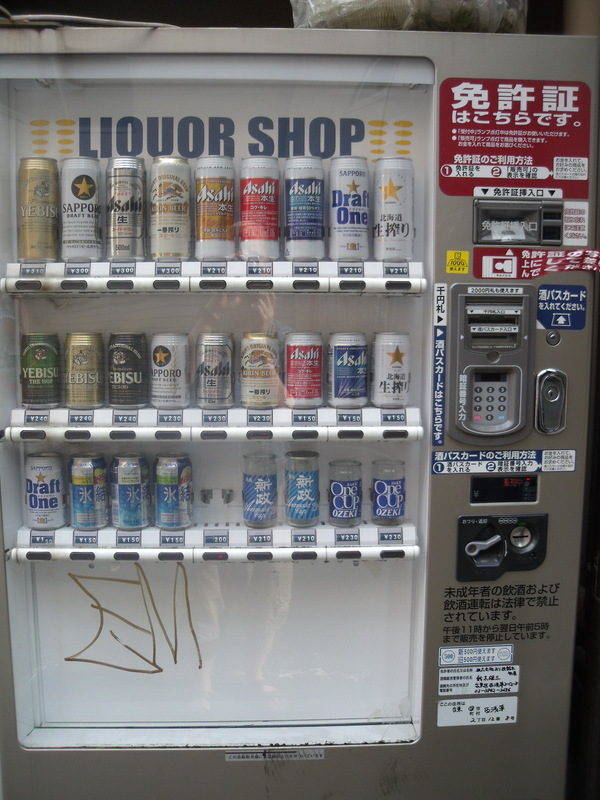 And let’s not even mention beer vending machines… I wonder how long a flight it is from Abu Dhabi??? H, you’ll get more food photos on Flickr soon. The food in Thailand’s pretty good as well – sorry to rub it in! Tom I’m in shock. Your first 2 sentences are positive! One could be mistaken for thinking you are being forced against your will to travel the world. You know me Jonelle, always looking on the bright side! Great stuff, Tom – and BTW you’ll find the missing translation at the Kamikaze Pilots’ Reunion Club if you should visit Tokyo again. With jokes like that anyone would think you were my Dad’s Dad rather than my Mum’s! 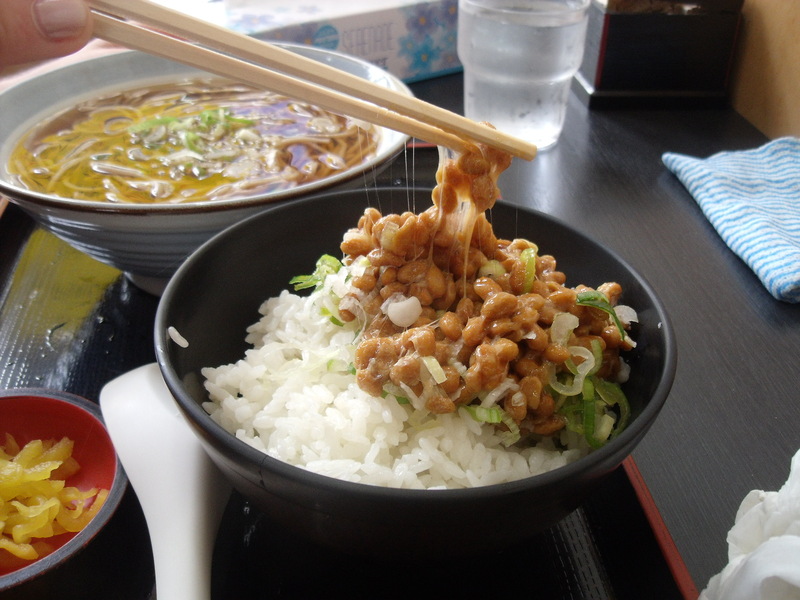 I could tell you the names of the foods you ate, and why almost of the restaurants in Tokyo’s drinking areas are noodle shops…but I think your post is perfect the way it is. 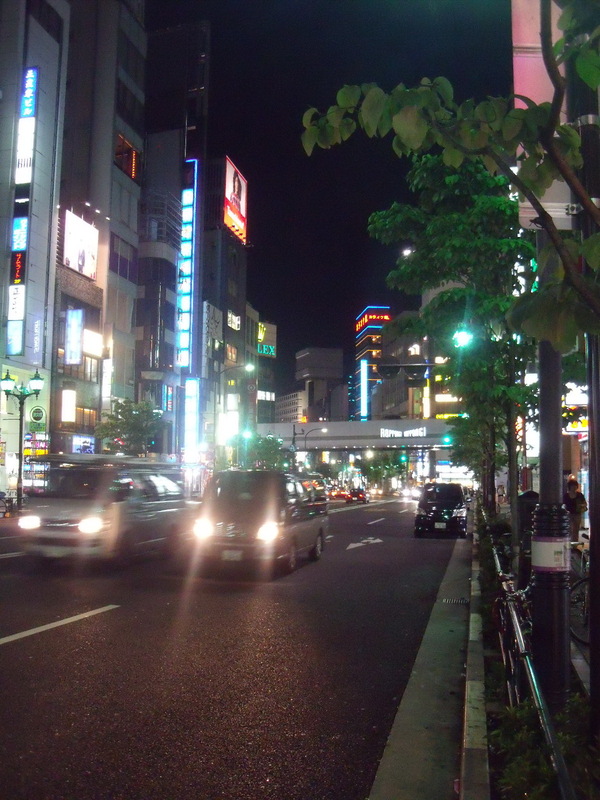 The impressions of Tokyo from a first time visitor. I’ve been living in Tokyo so long that outside of Japan seems foreign and odd to me now. Thanks for your kind comments tokyo5 – we loved Tokyo, you’re lucky to live there. Were we close with the fermented soy beans guess? >Were we close with the fermented soy beans guess? Called “Nattou“. It’s fermented soy beans. Sticky and smelly, it’s not popular with visitors to Japan. I’m used to it now. I like it a lot. But I remember how shocked by it I was when I tried it the first time (years ago).